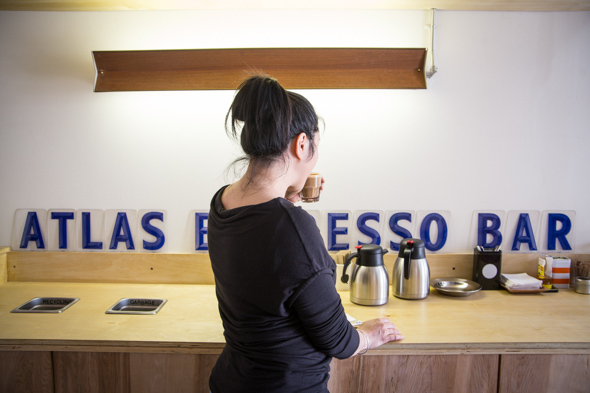 Atlas Espresso Bar has quietly creeped into a neighbourhood that doesn't quite feel like one yet. The bright and minimalist room is on Front Street, just west of Portland in a rapidly changing area that is made up mostly of condos. New businesses are only now beginning to pop up. 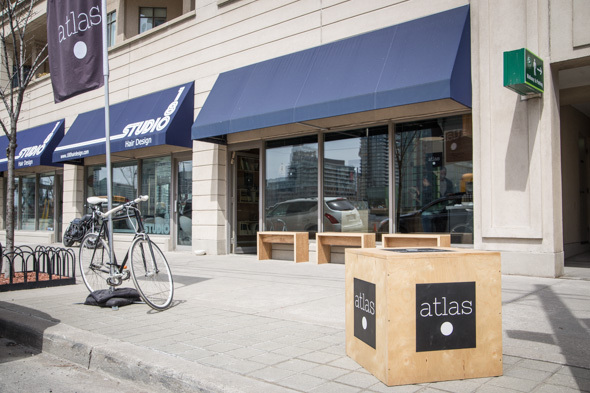 "We want Atlas to have a coffee pocket vibe, a little bit of an oasis," co-owner Sandrine Kwan tells me. "I have a lot of people already saying 'I feel like I'm in your kitchen.'" I believe her. There are doggie treats at the door. A regular - a St. Bernard named Korra - stops at the door, not walking away until she gets a bite. 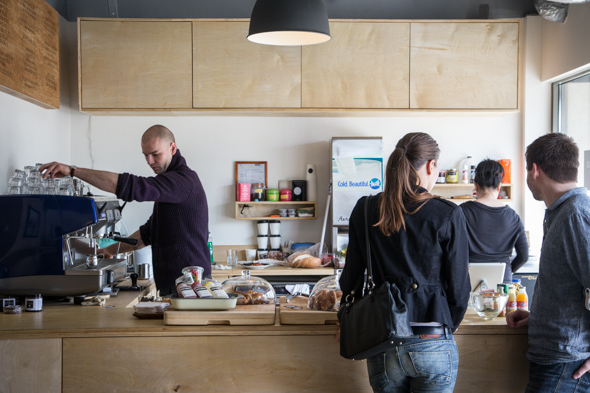 As for the humans, the kitchen is open facing them, with the espresso machine off to the side so that it's not a barrier between customers and the barista. Kwan opened the spot with two others, Bruce Dawson and Zion Forrest Lee. 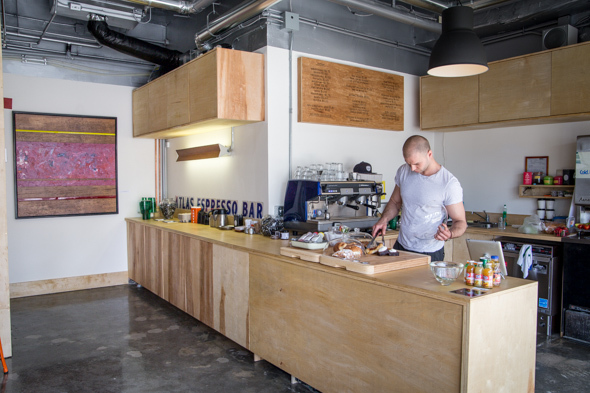 Dawson co-owns Kensington Market's Handlebar and Lee recently bought Mercury Espresso Bar in Leslieville . They have brought in chef Dale Fraser to collaborate on creative food and drink specials. 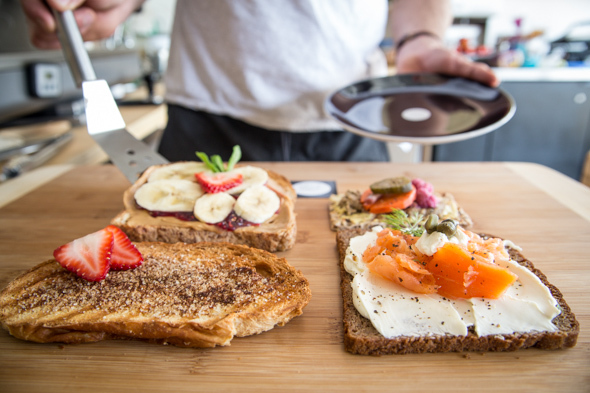 They're planning on tasty initiatives such as weekend takeout picnic baskets, cinq a sept specials , a pastry of the week and a weekly high tea . I've now visited the cafe three times and on each occasion there's been something new. I get the feeling the owners are not used to being in such a new neighbourhood and are trying everything possible to draw in residents. My fave drink so far is their cortado ($3.25). It's smooth and creamy, needs no sugar and is topped with a perfect dollop of crema. Atlas has also developed its own brew with Trebilcock coffee in Pickering, a traditional medium/dark roast Lee describes as tasting like "sweet tobacco, salted caramel and dark hazelnut chocolate." 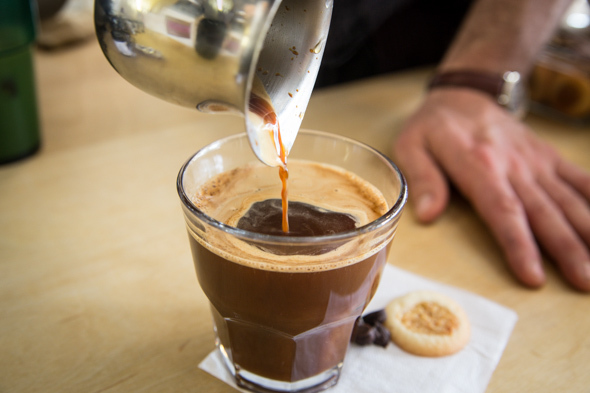 The espresso-based drinks, ($2.75-$4.00) are only sold in eight-ounce cups. Freshly-squeezed fruit juices are delivered every midday by Chasers . 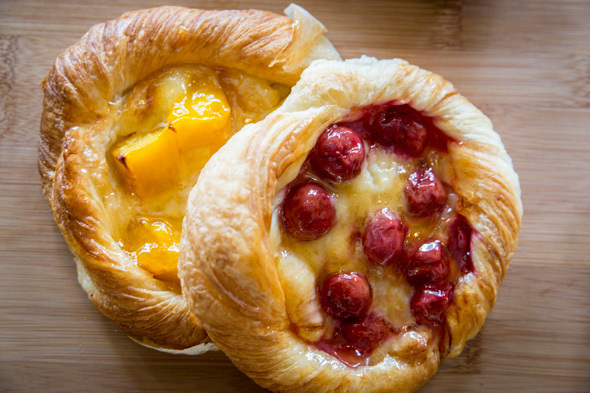 Pastries, sandwiches and veggie options are also on the menu. On the shelves are several copies of "The World Book" - those hardcover encyclopedias that had 31 editions just to get through the alphabet. It was our internet when there wasn't the internet. 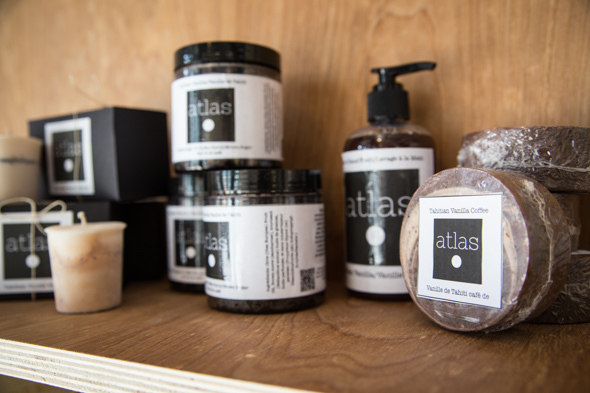 Atlas is trying to do a bit of everything, with a mobile app and even a line of exfoliating bath products made with their coffee grains. What should you do? Try the coffee. Writing by Diana Pereira. Photos by Jesse Milns.